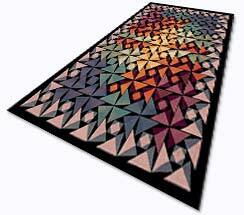 If DormRugs ships wrong or defective merchandise, it may be returned for a full refund, store credit or exchange. Return shipment must be by UPS ground and insured. You will be credited for your shipping cost. No COD's will be accepted. Please Note: We make every effort possible to realistically represent the quality, size, color and texture of our products. However, we cannot be responsible for variations in computers or graphics hardware and operating systems. Nor can we afford to ship items for inspection and/or approval at no cost. If you are not satisfied with your purchase, you can return the item to DormRugs for a full credit of purchase price minus shipping costs and a 15% restock fee within 15 days. Before returning a rug, please email us for a return authorization number (RA#). Make sure to affix the RA# to the outside of the package. Rugs without a return authorization number will be refused at the warehouse and mailed back to the sender.